metallurgical, building and other industry etc. 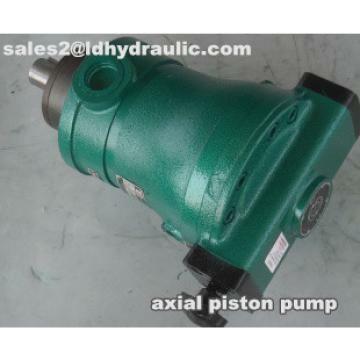 This series of axial piston pump will have 31.5 MPa pressure pure hydraulic oil input to all kinds of hydraulic press, hydraulic motor and hydraulic system, to generate huge motivation.At the same time, this pump can be used as a hydraulic motor. 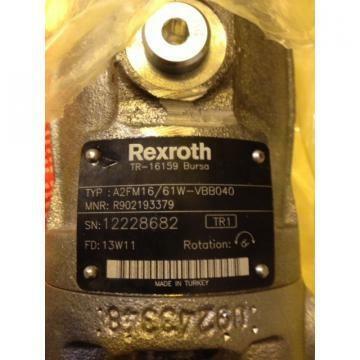 According to the needs, this pump has a variety of variable form. The oil pump, oil motor is widely used in ship, aviation, mining, metallurgy, casting, forging, machine tool of all kinds of machinery, its characteristic is small in volume, high efficiency, long service life, advanced design, compact structure, convenient maintenance. The main body is driven by the drive shaft to rotate the cylinder block, so that seven plungers evenly distributed on the cylinder block rotate around the center line of the drive shaft, and the sliding boots in the column sliding group are pressed on the variable head (or the swash plate) by the center spring. The plunger moves reciprocally along with the rotation of the cylinder body to complete the action of oil absorption and oil pressing. 1) Flow 1.25-400 MCY14-1B (quantitative axial piston pump) specific models: 1.25 MCY14-1B, 2.5 MCY14-1B, 5MCY14-1B, 10MCY14-1B, 16MCY14-1B, 25MCY14-1B, 32MCY14-1B, 40MCY14-1B, 63MCY14-1B, 80MCY14-1B, 160MCY14-1B, 250MCY14-1B, 400MCY14-1B. 2) Flow 10-400 SCY14-1B (manual variable axial piston pump) specific models: 10SCY14-1B, 16SCY14-1B, 25SCY14-1B, 32SCY14-1B, 40SCY14-1B, 63SCY14-1B, 80SCY14-1B, 160SCY14-1B, 250SCY14-1B, 400SCY14-1B. 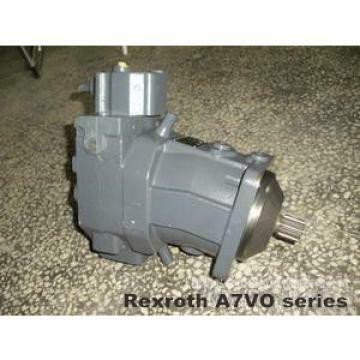 3) Flow 10-400YCY14-1B (constant power variable axial piston pump) specific models: 10YCY14-1B, 16YCY14-1B, 25YCY14-1B, 32YCY14-1B, 40YCY14-1B, 63YCY14-1B, 80YCY14-1B, 160YCY14-1B, 250YCY14-1B, 400YCY14-1B. 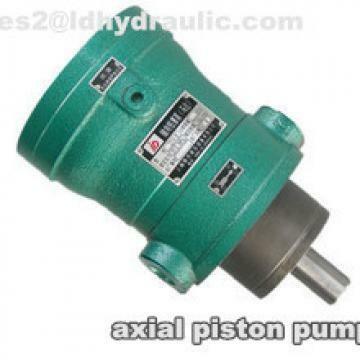 4) Flow 10-160MYCY14-1B (Classified Variable Axial Piston Pump) Specific Model: 10MYCY14-1B, 25MYCY14-1B, 40MYCY14-1B, 63MYCY14-1B, 80MYCY14-1B, 160MYCY14-1B. 5) Flow 10-400 PCY14-1B (constant pressure variable axial piston pump) specific models: 10PCY14-1B, 16PCY14-1B, 25PCY14-1B, 32PCY14-1B, 40PCY14-1B, 63PCY14-1B, 80PCY14-1B, 160PCY14-1B, 250PCY14-1B, 400PCY14-1B. 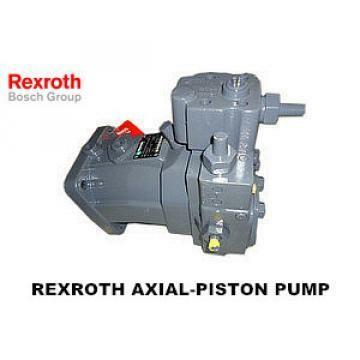 6) Flow 25-400 BCY14-1B (electro-hydraulic proportional variable axial piston pump) specific models: 25BCY14-1B, 40BCY14-1B, 63BCY14-1B, 80BCY14-1B, 160BCY14-1B, 250BCY14-1B, 400BCY14-1B. After sale service promise: the quality of this product is guaranteed for one year. packing: ordinary wooden case packing, for export, non fumigation wooden box packing. L&X Hydraulic Co., LTD. Copyright © 2017 - 2019 All Rights Reserved.